Ric on the trail. Bellissimo! 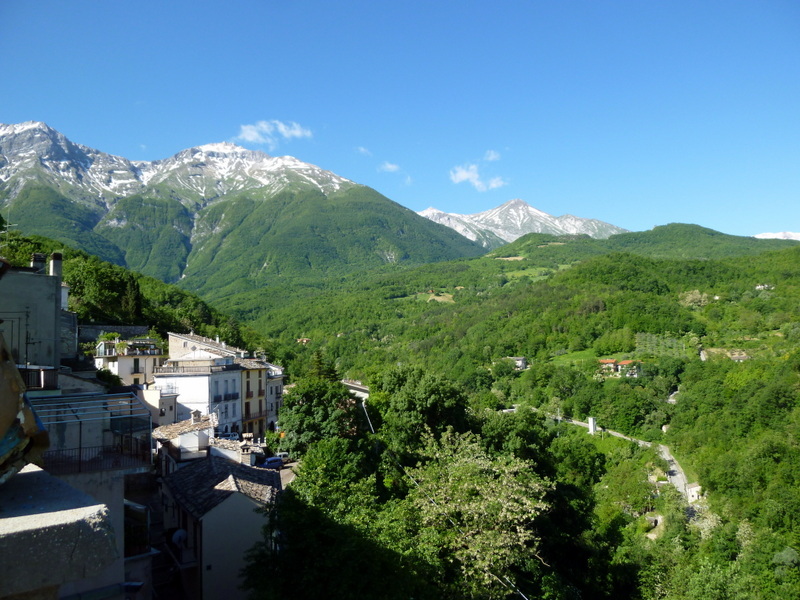 Like a beautiful dream, one night in the mountains of Abruzzo left us wishing for more: One night was simply not enough to satisfy. 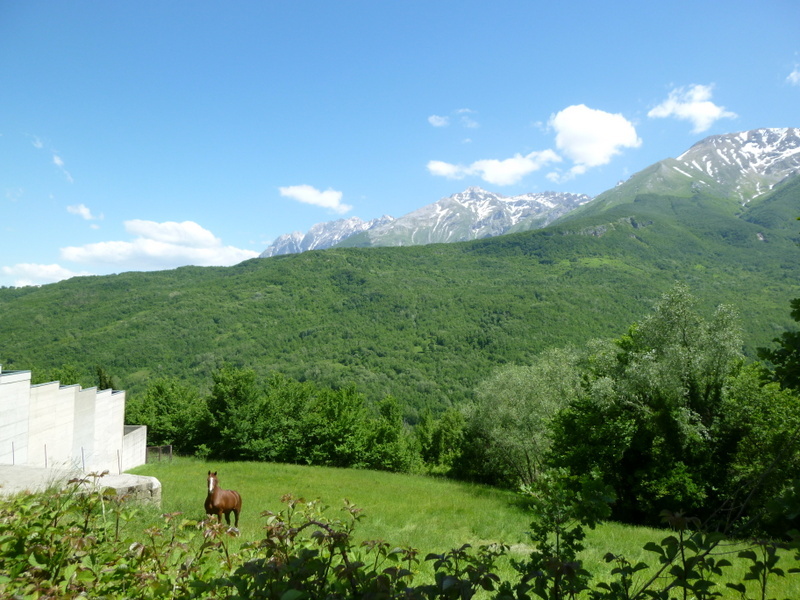 On our way back to Rome from Puglia, we decided to spend a night in Ornano Grande, in the shadow of the tallest peak, the Corno Grande. We sped our way north from Polignano a Mare arriving in time for lunch and an afternoon hike. Not a soul was in sight in the high meadows, only a little horse to greet us looking for apples or carrots. Once again the food was amazing, the wine abundant, and we spent a peaceful, restful night. There are myriad little towns and hamlets, and many mountain trails to explore. We’ll go back for the 4th-of-July weekend as it is only 2 hours from Rome. I’ll leave you with additional photos of this magnificent place. In fact, it is much like Oregon, but the food is better. 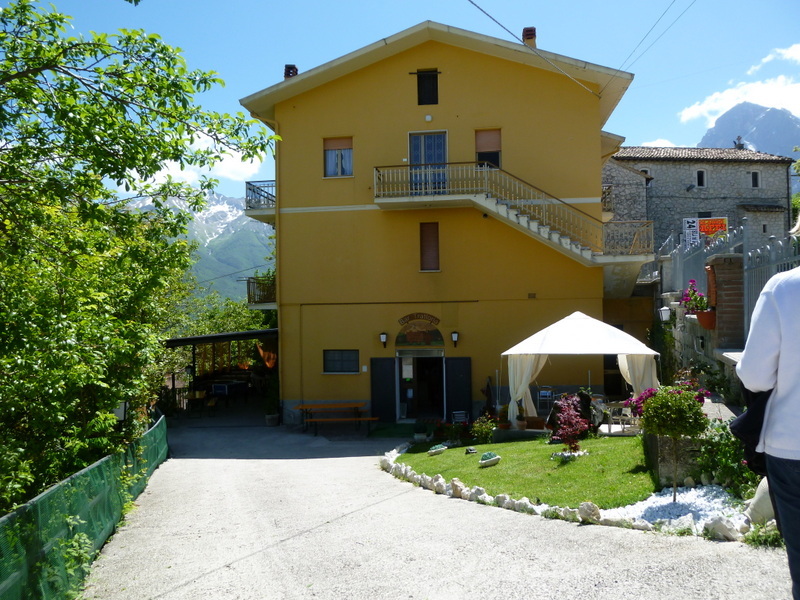 Cute trattoria in Forca di Valle where we feasted before the hike. 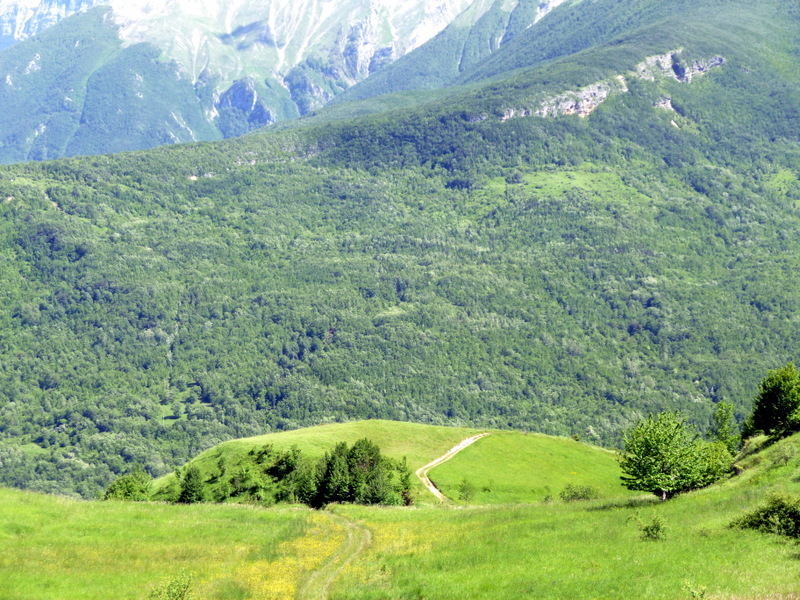 The trail we hiked across a mountain meadow near the Corno Grande. The only soul we encountered while hiking was this little horse, who was certain we had an apple for him. Next time! 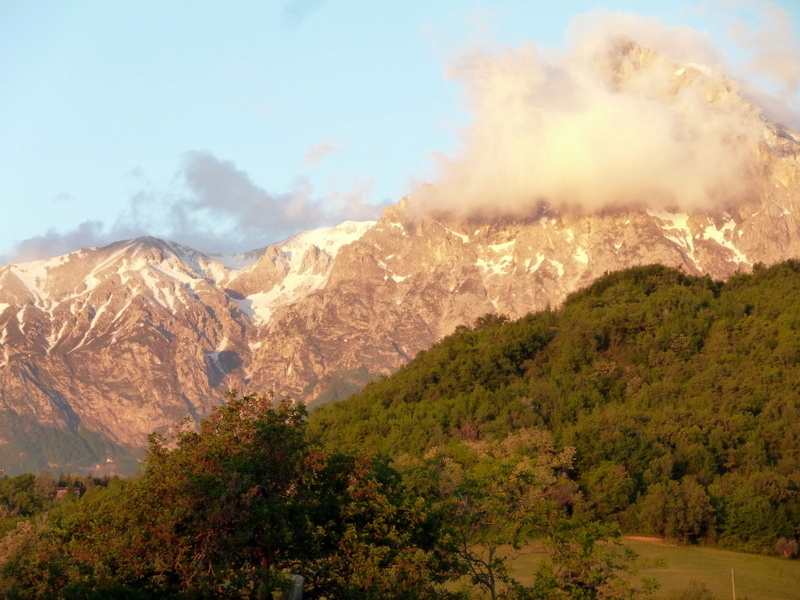 This is the view from our room that greeted me upon rising: Sunrise on the Corno Grande. How beautiful! I was waiting for Ric to break out in a Julie Andrews song. You made me laugh so! Thanks! How beautiful Laurel! I love, love, love hearing about all of your marvelous adventures! 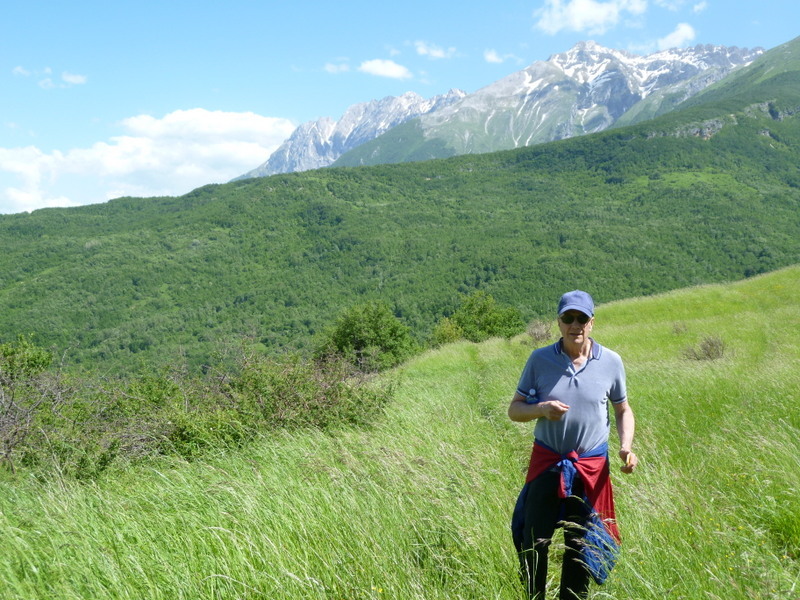 I hope we can muster the Femmes to Italy to visit you and experience some of the places – and food – you have experienced!! Oh wow, it is truly beautiful there! I would love to live in a little town as beautiful as that. We are so drawn to these small towns, yet love the excitement and majesty of Rome! Wow Laurel! So beautiful! My favorite wine is a Montepulciano Di Abruzzo. I know that there are many great wine regions in Italy and I’d love to try them all! Thank you for the wonderful posts. Bellissima! Would love to go there when we visit next summer if we can! Absolutely would love to take you there! Can’t wait to see you guys! What a beautiful experience….it really is pristine. Go back and take more photos!!!! I promise I will! Thanks for you comment, Cid! Not much I can add but to second Terah’s comments. Thank you! Well someone has to go out there and suffer the beauty. Glad to through myself on the sword. I can’t tell you how excited I am every time you post! It’s like a special gift when I open my email and see GooddayRome in the subject! Thank you for sharing your wonderful adventure with us. Grazie, Carolyn. We so fell in love with the mountains and the sea during all those years in Portland. Hard to believe we were “flatlanders” for so much of our lives. We’ll bring the pony some treats for certain. Love ya back!